So this is a picture of Celia and Frank, my Mum and Dad. 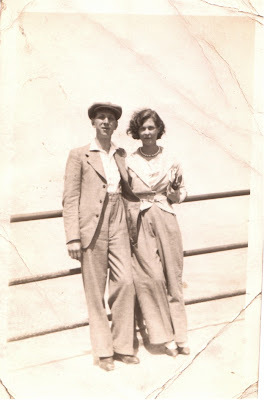 I think it was taken in the 1930' s, they might have still been courting or perhaps newly married. I don't think that Dad was much of a ' looker' , bless him, but he was such a great, kind, loyal man who Mum adored. She told me that when she met him she was attracted to his fine head of black hair and beautiful teeth . They belonged to a motor-bike club and had a big bike and sidecar and would go away for weekends with the club. Not long after they married though, they were involved in a bad accident on Blackfriars bridge; there were no traffic lights in those days and a car crossed and hit them. Apparently, Dad swerved to avoid the car crashing into the sidecar ( where Mum was) and took the full force of the impact on his leg. The outcome was 18 months in and out of hospital where surgeons battled to save his crushed leg. This they finally did achieve, so that was the really good news for them both, but the bad news for Mum was that the shock of it all caused Dads lovely black hair to fall out, so he was bald before he was thirty, and not only that he lost ALL of his teeth as well!! Good job Mum really loved him ( smile). They sound like they were really in love and a good match. What stress that must have been for him to lose his hair and teeth. It had been a bad accident, the other good news for Mum though was that he was unable to fight during the war because of his invalidity;He walked with a limp all his life,and never let it get him down. Memories!